The Update Kitchen Company offers a complete range of services, which can compliment your initial kitchen revamp ideas. We pride ourselves on our flagship service, which can deliver a Complete Kitchen Refurbishment satisfying every one of your design and installation requirements in a Full Service Package. You may need Worktops, the additional cabinet or a new appliance to compliment your new set of replacement doors, all of which can be incorporated into the Complete Service option, that ensures a hassle free and efficient installation project. Alternatively you may be starting from scratch for your new home or its just time to say goodbye to that old overworked kitchen. Rest assured The Update Kitchen Company can take care of the entire project from our Initial design process, we aim to make it easy for you to envisage the final results of your project. Your personalised Project Design Manager will visit you at your home to discuss your requirements then provide you with a realistic Set of 3D Colour visuals with ground plan, elevations and estimate. Alternatively we are happy to design from your Architect or Building Contractors plans. We have Fully Qualified multi-Talented building and Installation teams who can provide a full building service to prepare and complete the perfect room. All Plumbing, Electrical, building and decoration works can be catered for by our experienced teams. We are also more than happy to work alongside your building Contractor. Your allocated Kitchen Project Manager will be appointed to oversee your entire kitchen project alongside our Customer service Team who will all be available to answer any queries you or your contractor may have regarding the Installation of your new Kitchen. Most orders are made to measure and we only start making after careful consultation with your design specifications and when you order is placed. This enables us to be particularly creative at the design stage preventing unbalanced sizes and the need for over-sized panels. Allowing total flexibility to produce from our extensive range of tones, colours and materials, ensuring you can have the look that matches your vision. When Upgrading your kitchen with Replacement doors there may be the need to replace the odd unit, this is not a problem for us as we can supply to any height, width or depth being just the one unit to replace or for a full complete kitchen. All our Cabinets are the Full 18mm thick, even the backs are solid MFC18mm thick for absolute solidity. Shelves are 18mm thick and being fully adjustable for individual needs. 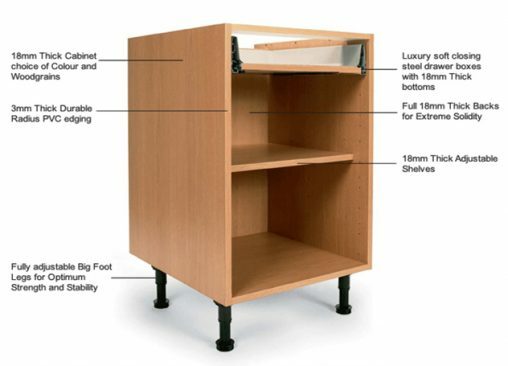 Units can be fitted with a choice of storage solutions, soft close door and drawer systems. All Unit Face edges are in hard wearing PVC edging. Cabinet Interiors are colour-coded or Woodgrain in a choice of finishes. Our Kitchen Units look almost as good without the doors as with them.